Two Expedition 55 NASA astronauts ventured outside the International Space Station May 16, 2018, for a 6.5-hour-long spacewalk. They were tasked with rearranging coolant pumps and replacing external cameras and antennas. Called U.S. Extravehicular Activity 50, the primary task of the spacewalk was to move two pump flow control subassembly, or PFCS, units. These devices are designed to drive and control the flow of ammonia coolant on the exterior of the ISS to regulate the temperature of the station’s power-generating equipment, according to NASA. In 2013, a PFCS failed after an ammonia leak. It was soon replaced with a spare by astronauts and stowed on the P6 Truss before recently being remotely removed by ground teams using the Dextre robotic “hand.” This failed unit was nicknamed “Leaky” by ISS management teams. A spare PFCS, named “Frosty” was located on External Stowage Platform 1, or ESP-1. Mission managers wanted to swap the locations of these two units so that the working device would be more accessible should it be needed. Once installed on Dextre, it will be remotely moved into its final location by ground teams. The 6.5-hour-long spacewalk was performed by NASA astronauts Drew Feustel and Ricky Arnold. It was their eighth and fourth walk in space respectively, and the 210th overall spacewalk for the ISS program. After donning their spacesuits, the two inside the crew compartment of the Quest crew lock slowly began depressurizing the chamber. At 8:39 a.m. EDT (12:39 GMT), they switched their suits from the space station’s power to internal battery power, signifying the official start of the spacewalk. Feustel was wearing the suit with the red stripes and was designated EV1 while Arnold wore the suit with no stripes and was designated EV2. Once outside the airlock, Arnold moved to ESP-1 where Frosty was located. Feustel made his way over there to, only via a different path around the station’s Destiny Laboratory. The two worked to prepare the relocation of Frosty. Once finished, Arnold translated over to Dextre at the other end of Destiny where it was holding Leaky. Both Feustel and Arnold brought Leaky to a temporary stow location next to ESP-1 before removing Frosty and moving it to where Leaky was located on Dextre. After that, the two moved back to ESP-1 to move Leaky from its temporary stow location to the spot that Frosty was previously attached and place a thermal thermal cover over it. The first task completed, Arnold then moved to the S0 Truss to attach a foot restraint on the robotic Canadarm2, which he rode to the starboard side of Destiny to replace a camera group consisting of a standard-definition camera, its light, its pan-and-tilt mechanism and an electronics box. Feustel meanwhile cleaned up the ESP-1 work space before translating over to Arnold’s location. The two worked together to replace the camera group. Once completed, Feustel went back to the airlock to grab a spare space to ground transmitter. He took it to the Z1 Truss to replace a failed space to ground transmitter with the spare. Arnold, meanwhile completed installing the new camera group before being moved by Canadarm2 back moved back to the S0 Truss. With all the primary tasks completed, mission control assigned each with several small get-ahead tasks, which were completed in short order. At that point, the duo worked their way back to Quest. Once back inside the airlock and the hatch closed, the two astronauts began re-pressurize the compartment, officially ending the fifth spacewalk of 2018 at 2:10 p.m. EDT (18:10 GMT). The total time for U.S. EVA-50 was 6 hours, 31 minutes. 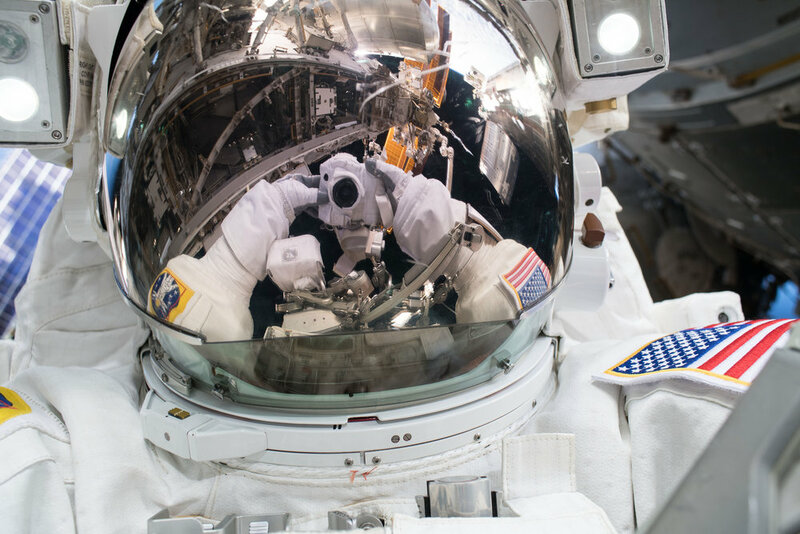 According to NASA, spacewalking astronauts and cosmonauts have now spent 54 days, 16 hours and 40 minutes working outside the ISS for assembly and maintenance purposes since 1998. The next spacewalk is planned for June 14, 2018. It will also be performed by by Fuestel and Arnold.